Recommended practice for the ultrasonic phased-array inspection of In-Service raised-face (RF) flanges. 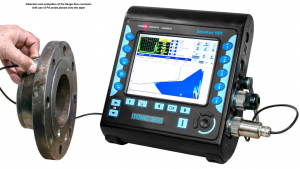 Due to the geometry associated with RF Flanges this inspection application requires a good understanding of the damage mechanism and the limitations related to inspection access. 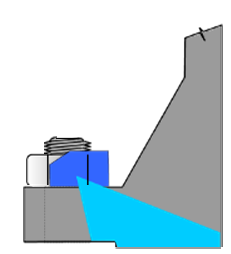 The technique should be utilized as a means to prioritize flanges that require further evaluation during next planned outage. 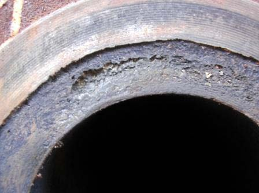 The main aim of this inspection is to detect and evaluate levels of corrosion on the flange face, which, if were not detected could result in leaks under the flange seal. Phased Array Ultrasonic’s allows the operator to generate an array of ultrasonic signals (example: 35-85 degrees) from a single fixed point to give a comprehensive sweep of specific zones within the test part; in this case being our Flange. There are three available surfaces from which we can place probe to evaluate condition of both bore and flange sealing face. 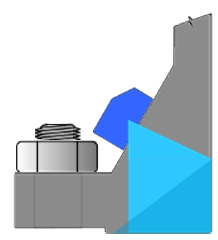 First step prior to inspection is perform dimensional verification of flange and then utilizing custom software we can generate computer model to accurately identify the coverage we can obtain from each placement of probe. 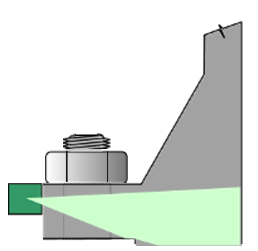 The drawing below displays a typical model of flange with phased array coverage normally referred to as PA Scan-plan.